PRO ADVICE: All About Shipping! When dropshipping products from a number of suppliers, shipping can be a confusing part of the initial store set up. This article will walk you through everything you need to consider from start to finish! With dropshipping, a great benefit is that you do not need to ship your products out - the supplier ships the product directly to your customer for you! Because they are shipping out the item, rather than you, they have set shipping times and costs they offer. This can vary from one supplier or product to the next, as well as one location to the next. This also means that you have to gather shipping amounts from the customer, and then pay the supplier the amount they require. If you don’t gather shipping fees from a customer, you’ll have to take a cut of your profit to cover shipping charges from the supplier, so you will want to be sure to consider this! You’ll notice most suppliers will offer you a free shipping option, or it will cost a few dollars to ship. If they offer ePacket as a shipping option, I recommend you go with that. There is more info on why here. Now that you know what the shipping cost and time is from the supplier, it’s time to work on your shop set up! Since shipping that the supplier charges you and what you charge the customer is separate, we need to set something up that aligns with both. I usually recommend bumping up your profit margin on your items, then offering free shipping to your customers. This way it keeps setting up shipping easy, plus customers love free shipping. Especially if shipping time is a bit longer, if they get free shipping it can help decrease churn rate on orders. If you don’t want to offer free shipping, and want to charge a base amount, that is fine too. Just keep in mind you cannot offer Carrier Calculated Shipping - as you are not the one shipping out the product, and the suppliers have different warehouse locations, so the system won’t work with dropshipping. Now that you have your shipping set up on your shop, let’s go over additional set up you might want to consider! 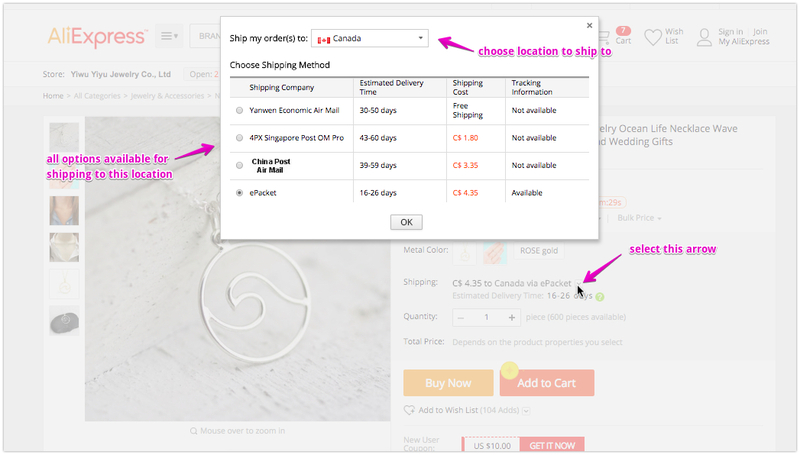 Aside from these places, I would also suggest making a Shipping FAQ page for customers to visit. Once you have made the shipping estimate clear to customers, you will also want to update them on the process throughout the delivery. That begins with sending them a shipping confirmation email which includes tracking info. Check out this article from the Oberlo help docs that walks you through how to update your email to include tracking. 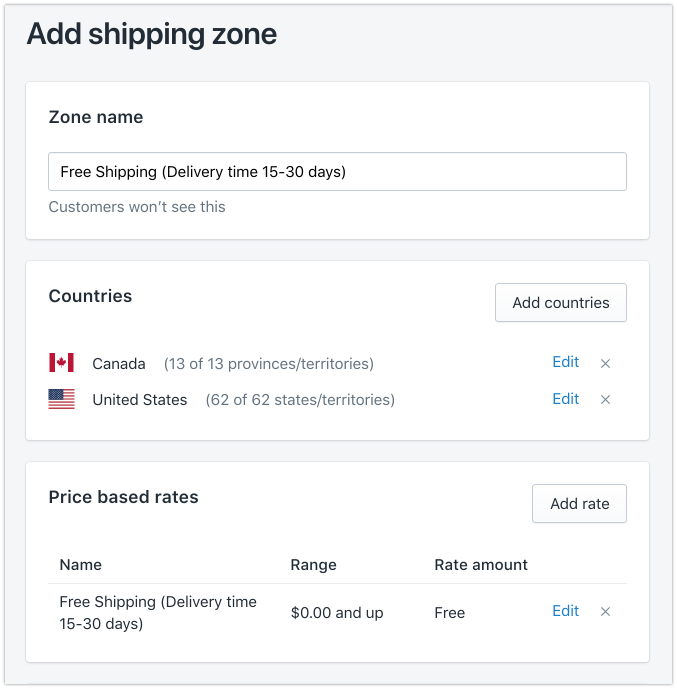 As an added bonus, you could add a sentence in your shipment email letting customers know you are dropshipping or working with a fulfillment center, and that products may arrive in separate packages (if they ordered more than one item). That’s it! 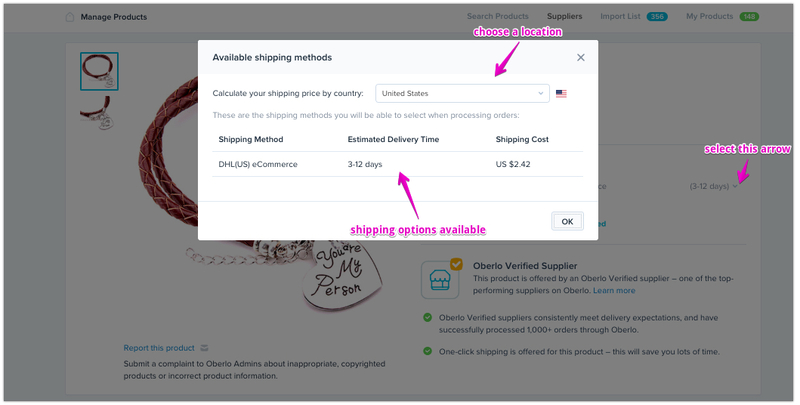 We have now checked the supplier costs and times, updated your Shopify settings to align with that, and set up notifications for your customers. I hope this was helpful! Happy dropshipping!